The ‘Sloane’ women’s watch is brought to you by renowned fashion designer Tommy Hilfiger. 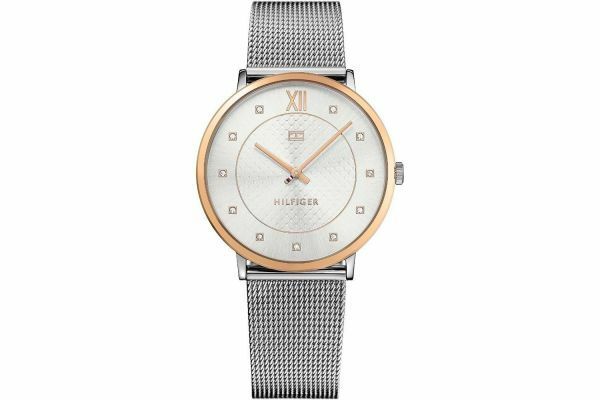 The Sloane is an elegant timepiece featuring a stainless steel mesh bracelet which is beautifully contrasted by the round 40mm highly polished rose gold case. A stunning example of refined luxury, the Sloane features a subtly textured silver dial accentuated by rose gold batons and crystal set hour markers. Protected by mineral glass and powered by Quartz movement this watch is waterproof up to 30 metres. Simple yet striking; the Sloane watch exudes grace and beauty, an effortless accessory for both formal and casual attire. For us to size your new Tommy Hilfiger Sloane watch as accurately as possible, please take a look at our downloadable Watch Sizing Guide.